Not content to rest on his 702 and 709 laurels, Bob Widlar moved on to another company, National Semiconductor Corporation (NSC). His next IC op amp design, the LM101, was introduced in 1967. This began a second IC op amp generation (the 709 is generally regarded as the first generation of IC op amps). The LM101 family1 used a simpler two-stage topology, one that addressed the application problems of the 709. It was also an op amp design that infl uenced a great many ones to follow. A simplifi ed circuit of the 101 is shown in Figure. Latchup with high CM inputs. Sensitivity to excessive differential input voltage. Excessive power dissipation and limited power supply range. For the same reasons that the 709 has historical importance, so does the LM101, as it represents the next opamp technology level. 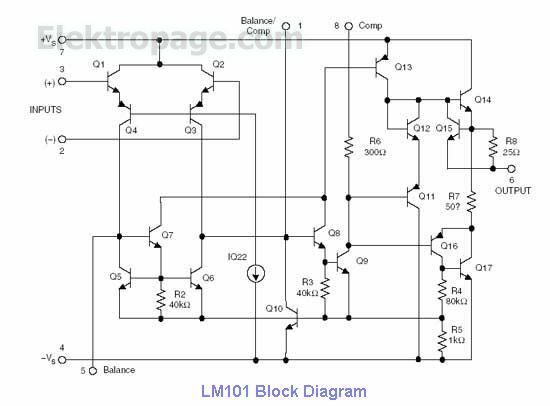 In fact, the all-purpose topology used is the basis for a range of many other generalpurpose devices, variants of the LM101 design. The new 101 design did solve the 709’s problems, and it added some further refi nements. Gain was 160,000 (~104 dB), and the useful supply range increased from ±5 V to ±20 V. For easy upgrading, the 101 used the same pins as 709 for inputs, output, and power. A major goal of the 101 design was simpler frequency compensation. To enable this, the 101 uses a twostage amplifi er design, as fewer stages are easier to compensate. But, to retain high voltage gain, the two stages needed the gain of the three 709 stages. In the 101, the high gain per stage is done using active loads, which increase the available gain per stage to a maximum. An example is Q13, which provides the collector load for Q9. In the fi rst stage of the 101, active loading is also used, Q5–Q6. Q1–Q4 and Q2–Q3 here form an equivalent PNP differential pair. Although the PNPs have low gains, they are buffered by high-gain NPNs, Q1–Q2. The net resulting input current was 120 nA. Note that the CM input range of this stage is quite high, as Q1–Q2 can swing positive to +VS. The negative CM limit is about four VBE above the -VS rail. This wide CM range prevents input stage saturation and latch-up. Another feature of this composite input stage is a very high differential voltage rating, due to the PNP high base-emitter breakdowns. The input stage can safely tolerate inputs of ±30 V.
The second stage of the 101 is the common-emitter amplifier, Q9. With the above mentioned loading of Q13, this stage achieved a voltage gain of about 60 dB, and the overall gain of the op amp was typically over 100 dB. A class AB output stage is used, consisting of NPN Q14, and the equivalent PNP, Q16–Q17. These transistors were biased by Q11–Q12. Sensing resistors R7, R8, and Q15, along with an elaborate loop comprising Q16 and Q9–Q10, provided current limiting. can be noted from the 101 internal connections, this capacitor makes the second gain stage Q9 an integrator, forcing overall gain to roll off from its maximum value of 104 dB at 10 Hz at a rate of 6 dB per octave, crossing unity gain at about 1 MHz. This compensation made a 101 device stable in any feedback confi guration, down to the unity gain. Viewed analytically, the 101 op amp topology can be seen as a two-stage voltage amplifi er, formed by an input gm stage consisting of Q1–Q6, which drives an integrator stage Q9 and the compensation capacitor, and a unity gain output buffer, Q11–Q17. But, a salient point to be noted is the fact that this form of compensation takes advantage of pole splitting in the second stage, which results in the multiplied capacitance of the compensation capacitor to provide a stable –6 dB/octave roll-off (see Reference 5). This was a critically important point at the time, as it allowed a single small (30 pF) capacitor to provide the entire compensation. Many two-stage IC op amp architectures introduced since the original 101 use a similar signal path and compensation method.